KATHMANDU, Jan 21: A little short of reminiscing the fourth year of the devastating earthquake the struck the nation in 2015, Bhaktapur Durbar Square is awaiting the number of tourists visiting the ancient town of Kathmandu Valley to bounce back to pre-earthquake figure. 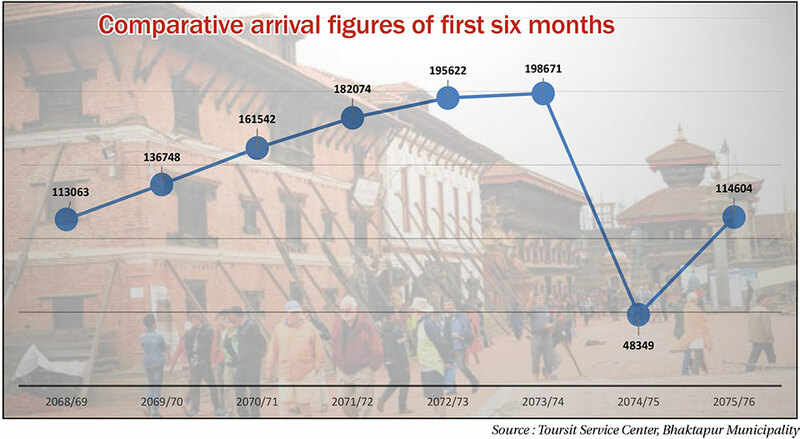 The number of tourists setting foot in the Durbar Square in the first-half of Fiscal Year 2014/15 had peaked to a record 88,288, just before the earthquake. Although not quite there, the number of tourist arrival in the first-half of the current Fiscal Year 2018/19 has reached 76,139 so far. This is an increase by 9,149, or 13.3 %, from the same period of last fiscal. The year following the earthquake saw the number taking a steep dive to 27,530 in the first half of FY2015/16, a decrease by 68.8 percent from the corresponding period the previous year. 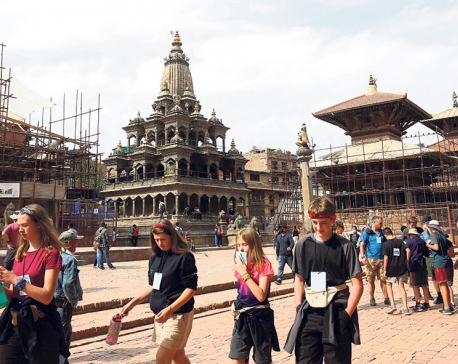 Since then, the number of tourists visiting the Durbar Square in the first half of fiscal year has been increasing steadily. Previously, 75,662 tourists had visited the place in the first half of Fiscal Year 2010/11. "The number of tourists was growing steadily before earthquake. But as you can see from the record books, the earthquake greatly struck the confidence of tourists visiting the country," said Ramesh Thapa, general secretary of Nepal Association of Tour and Travel Agents (NATA). Commenting on the data, he added: "However, the number of tourists greatly improved from about 27,000 in the first-half of 2015 to almost 57,000 in the first-half of the following year. This has continued to improve in subsequent years." He further claimed with confidence that the number of tourists arriving by the end of current fiscal's first-half will surpass the 2014/15 peak of 88,288. President of Hotel Association of Nepal (HAN) Amar Man Shakya also appreciated the increase in tourist numbers. But there were things to improve, according to him. He further added: "The pace of reconstruction work has also been a major factor hindering further growth of tourism in Bhaktapur." He speculated that if the reconstruction work could easily take more than two years to complete if it continued at the current pace.